In our previous blog post, we looked at the traits that define high quality plastic surgeons, such as outstanding professional credentials and a portfolio of excellent past work. Cosmetic surgeons who demonstrate these key traits are more likely to have the skills and commitment to help you get the results you want with minimal complications. But what about the flip side of the coin? 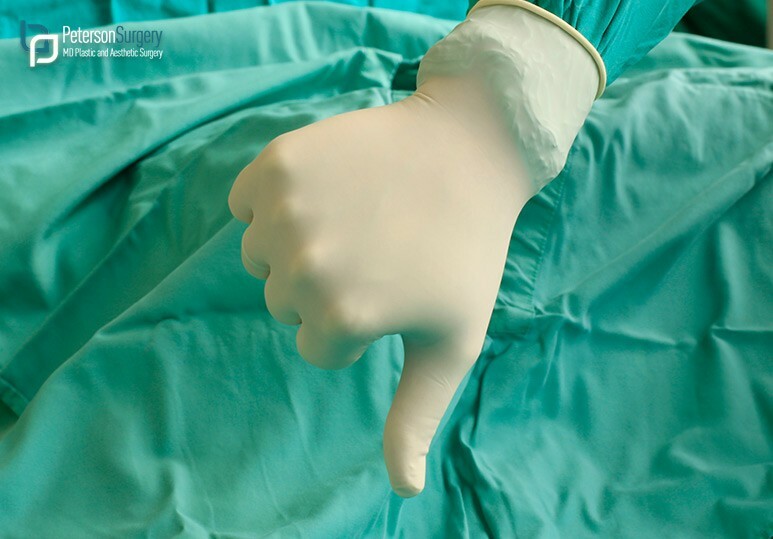 Are there certain red flags that indicate your prospective plastic surgeon is not very good? Dealing with a botched surgery of any type can be a tremendous headache, so it’s always a good idea to review a potential cosmetic surgeon carefully before undertaking any procedure. Missing credentials: Avoid any plastic surgeon who does not hold legitimate certifications or is not a member in good standing of relevant professional associations, such as the Canadian Society of Plastic Surgeons. Heavy “salesy” tone: Established plastic surgeons don’t need to use pushy sales tactics to generate business. If your plastic surgeon keeps trying to sell you unnecessary services, it’s best to move on. Lack of industry recognition: Many of the best plastic surgeons are actively involved in their field and well‐connected. It’s a bad sign if no one has really heard of your plastic surgeon or fellow surgeons are reluctant to recommend him or her, especially if your plastic surgeon has been practicing for a while. No hospital privileges: Similar to Red Flag #3, this is a sign of a lack of endorsement from medical colleagues, as most hospitals will only grant access to reputable plastic surgeons. Unrealistic promises: All plastic surgery procedures come with risks and there are no guarantees that your final results will look exactly a certain way. Any plastic surgeon who doesn’t explain pros and cons should be examined thoroughly. Poor listening skills: In order to deliver your intended results, it’s incredibly important that your plastic surgeon develops a clear understanding of your needs and goals. If it seems like your plastic surgeon isn’t really listening to you and doesn’t seem to care about your concerns, look for someone else. Limited relevant experience: Is your plastic surgeon unable to provide examples of past clients who have had your same procedure? This can be a sign of a lack of experience‐‐seek out a cosmetic surgeon who has a strong portfolio of work related to your specific area of concern. Inadequately trained staff: Your plastic surgeon’s team members have an important role to play, providing you with useful information, maintaining the clinic, and supporting the plastic surgeon throughout the procedure. If it seems like the staff aren’t sure what to do or have a noticeably low morale, this can be a recipe for disaster. Go with a plastic surgery clinic that has a team of knowledgeable, engaged professionals. Poorly maintained clinic: Does the plastic surgery clinic look like it could use a good cleaning? Are the clinic’s communications and policies unclear, confusing, or inconsistent? Some of these red flags are more obvious than others, but they are all cause for alarm. A poorly run clinic is more likely to produce low quality procedures. Many of these red flags can be frightening. Use these tips as an initial benchmark for your decision making process. Contact Dr. Brian Peterson today to learn more about our services or to book a consultation at (250) 868‐9099 or toll free at (888) 505‐8895.